It may not look it, but what you see before you is a breakfast pizza. 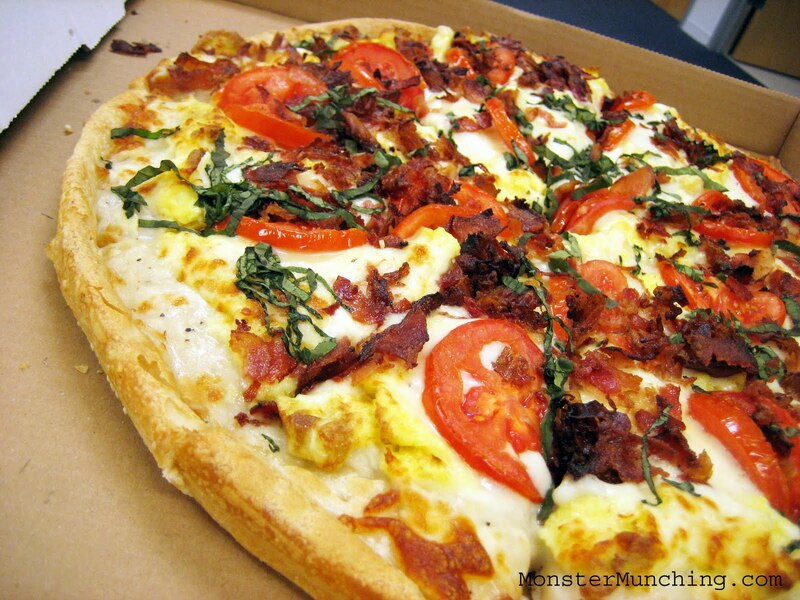 Yes, a breakfast pizza. I repeat. A breakfast. Pizza. I did not seek it out, nor would I have been interested in it if my co-worker didn't come back from lunch one afternoon and excitedly proclaim that he just saw it on a poster at Pat & Oscars. By the time he finished describing it--that it came with country gravy, eggs, bacon, and sausage--another co-worker was already saying "When?". "When were we going to pool a few bucks to try it?" the dude asked like an eager, bright-eyed kid who's just been told the circus is in town. When? Apparently, the next morning. And not only did he order one, he asked for the largest pie, retailing at close to $18, even after our protestations that it would be too big, that we only wanted a taste. "If you guys can't finish it, I'll just have the rest for lunch!" That's the kind of guy he is. Practical. And also, obviously quite confident that Pat & Oscars wouldn't make a bad pizza, a point that I had to politely agree to disagree with him on. 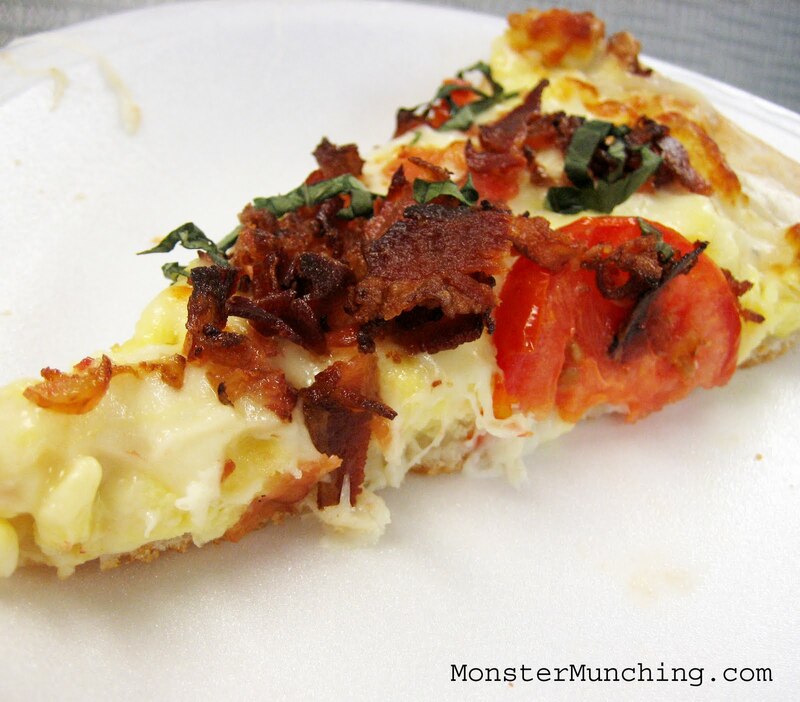 But as it turns out, as far as the breakfast pizza is concerned, he was right. It was a good breakfast pizza. Admittedly, there was no previous benchmark I could measure against. Still, the thing was much better than I expected. In fact, I ate two slices though I only really needed one. The eggs, the thing I was most skeptical about when I heard of its existence, was not overcooked. Nicely scrambled and still somewhat blubbery, it accounted for most of the thickness and was covered with thin, insulating top layer of cheese. The pizza was so loaded with egg, it was just a millimeter shy of being called a deep-dish, or maybe, a quiche. There was no sausage unfortunately, but there was bacon, crispy, crackly shards sprinkled over the top like pork confetti. And beneath it all, the country gravy was spread out like it was red sauce, but without any of its oomph. It didn't need to be there at all, and might as well have been omitted. The sliced tomato and basil chiffonade was, in contrast, indispensable. It cut through the richness with a bright splash of fruit, refreshing acid, and cleansing herb. The only thing that was missing to help it out was a bottle of Tabasco. After other cubicle mates gathered around to see and try the oddity themselves, we were all agreed that this was a much better idea than that time we went out to try the Double Down. 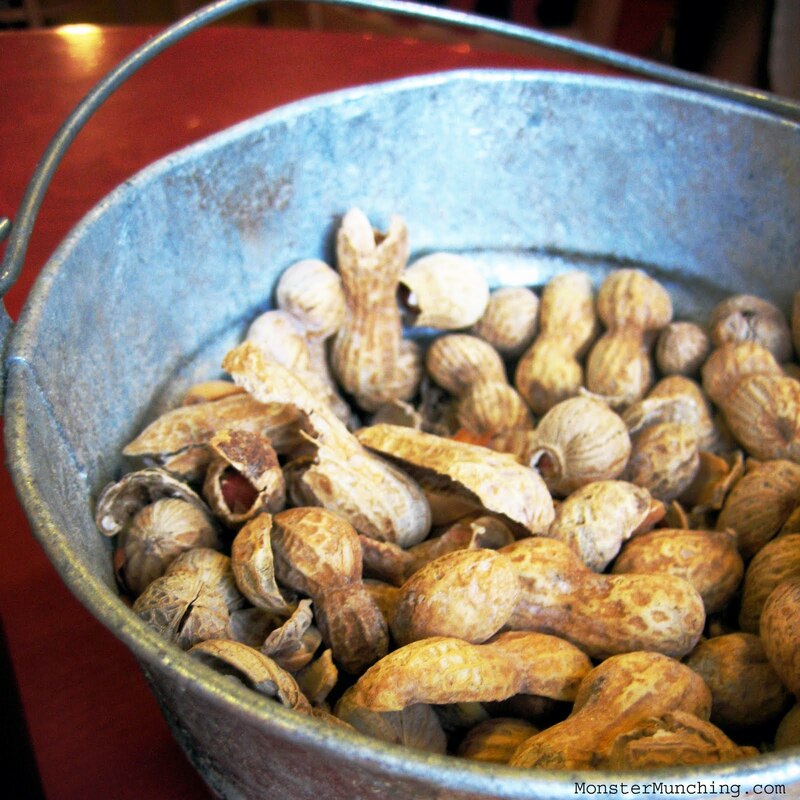 We are not cheapskates when it comes to food; but we are impatient. Height-of-the-hype Kogi days included, any line that wraps around a building is usually a sign we should go somewhere else. 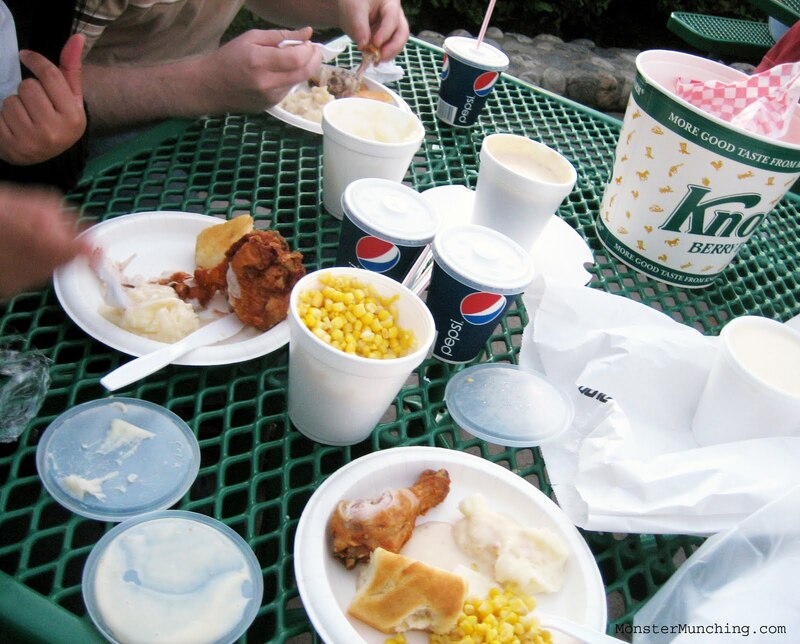 And so when when we saw what looked like a queue for Star Wars leading up to Mrs. Knott's Chicken Dinner restaurant, our hearts sunk, because by then, we had fried chicken on our brains and mashed potato cravings in our gut. Then we saw salvation: a way to get our chicken without so much as a ten-minute wait. And even better: without paying a single dime on tip. 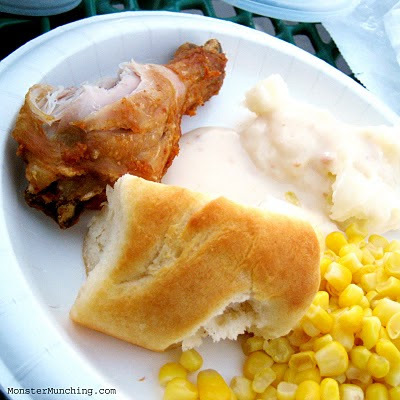 Mrs. Knott's Chicken-To-Go counter was mere feet where people were still standing around for the sit-down experience. These folks would all eventually get in, get served by probably a happier Knott's employee than the frowny-faced cashier who took our order at the Chicken-To-Go joint; but by our estimation, we were already licking our fingers and rubbing our tummies full from a meal well-eaten while they were still mulling menu choices. And on top of that, it was inexpensive to boot. The dinner bucket we chose for $19.95 could have easily fed four people. It was certainly enough for the three of us with 9 pieces of hen, 2 tubs of mashed potatoes we couldn't even hope of finishing, 1 tub of gravy, 1 equally tall tub of a side of our choice, and more biscuits (of the tender and fluffy variety) with boysenberry preserves (a fruit that was popularized by Walter Knott, donchaknow) than we knew what to do with. They even gave us paper plates and utensils. We took our haul to picnic tables conveniently located behind Pink's and promptly started diving in, slopping the creamy mashed spuds onto our plates, dousing the entire thing with a thick, white gravy so rich we saw it congeal to sludge the longer it was exposed to the cool night air. Then we bit into the chicken. Now, it must be said that none of us, in our decades as OC residents and food boosters, ever tasted the fried chicken at Knott's. I think I was the first one to say it: "What took us so long!?" Though I can't unequivocally proclaim that it's the best fried chicken in the world, it's certainly one of the best in Orange County. First thing we noticed is that it's not oversalted, not overbreaded, and not underfried. You know the lead-weighted feeling like you've just downed a cup of grease and salt after KFC? Not here. If it is possible, this fried chicken left us feeling light in our step, like what we ate was health food. I picked clean three pieces but I could've eaten a fourth. A fifth, however, would've probably killed my mobility. It's still fried chicken, after all. But for sure, if this is the same chicken that Cordelia Knott produced to such acclaim that it begat an amusement park, then it all makes sense. In fact, I'd imagine it would have been much better back then. 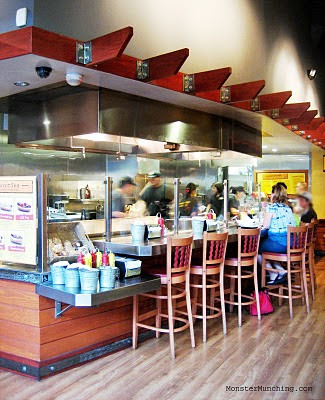 Of course, in the 1930s, there wouldn't be a Chicken-To-Go option, just a line that wrapped around the building. Jerry's Dog is homegrown and that's the way I like it. 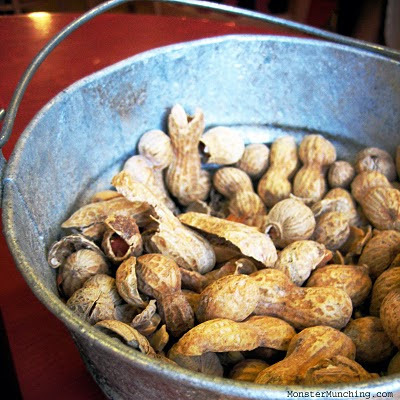 The chain, started seven years ago in Santa Ana by one Jerry O'Connell (no, not the guy in Piranha 3D who married Rebecca Romijn) has grown to four outlets, each with buckets of free peanuts, and all exclusive to Orange County and Orange County alone (at least for now). This one's the newest and to me, closest. So close it can be walked; but far enough that doing so can be called exercise. I took the hike after some urging from my lovely companion who thinks I could do well with a little cardiovascular activity once in a while. I agreed on the promise that a glistening, fat-spurting sausage sandwich was at the finish line. Yes, my carrot was a Jalapeno Hot Link flecked with nicely sooty black spots where a wood fire kissed it. The bun? It was grill toasted too. And that part's essential because since they use a particulary soft roll, you need the extra protection from the moisture that will leech out from all the free toppings you will be invited to pile onto it. I've matured some over the years and stick with maybe just two sauces, grilled onions, grilled peppers and some tomato. That's about all I need. Any pickle (and they have a lot of that) distracts from the sausage in my opinion. And you want all the juice, all the fatty goodness, and in my case, the jalapeno-amped flavor of the grilled tube of meat to speak loudly and clearly. Mine was nicely spicy even before I asked to get a drizzle of chipotle mayo squirted on top. 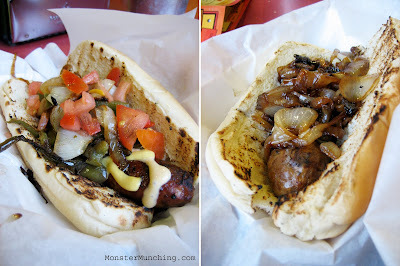 The bratwurst, seen here on the right, is a kinder, gentler dog. It cozies up to you with a sweet milkiness--a contrast to the rude and spicy bark of the Jalapeno Hot Link. So yes, I walked to get a dog and it was a good one. On our next trip, I have my eye on a bacon-wrapped wiener they call the "L.A. Dog". I think I'll drive to get it, because nobody walks in L.A. The people at Habibi's Funnel Cakes in Tustin have guts. They've opened a funnel cake shop at just about the unlikeliest of places: in a corner minimall underneath a freeway overpass. But then, when you think about it, any place besides a county fair or an amusement park is an unlikely place for a funnel cake stand. You can understand the impetus for the folks who started The Funnel Factory at the Irvine Spectrum. They're right underneath the plaza's ferris wheel. But ask yourselves this: why do funnel cakes make more sense there than here at the corner of some busy intersection in Tustin? Does twirling around on a ferris wheel suddenly spur appetites to crave funnel cakes? I, for one, hope Habibi succeeds. 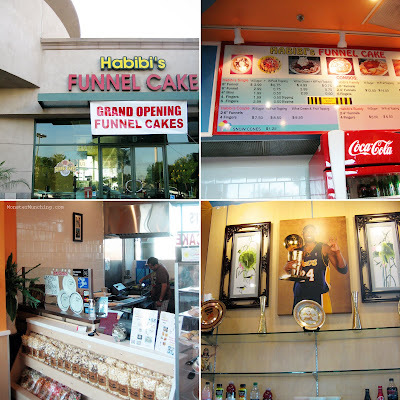 And despite inciting spirited discussions on the business's viability between my friends and I when we tried it this weekend, we all liked Habibi's funnel cakes. We walked into the tiny room and noticed it smells like a donut shop. And though we expected to be gouged, we found the prices are actually quite reasonable. In fact, they're cheap, as far as funnel cakes go. And how were they? Well, they're funnel cakes. Quite honestly, I don't think I've ever had a bad funnel cake. Habibi's are just as good as any of them: light and crispy as they should be, dusted with powdered sugar everywhere not covered with strawberries (or your chosen topping). About the only surprise is the big poster of Kobe Bryant displayed in a sort of reverential way reserved for a god. Makes one wonder: does he like funnel cakes? He probably does. Who doesn't? 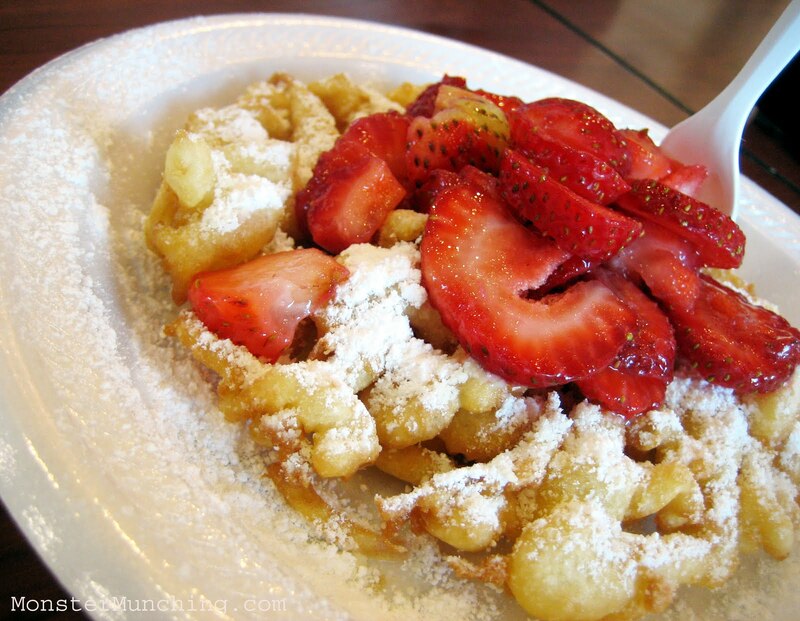 But here's another nugget to think about for you armchair business analysts: a funnel cake food truck. There's already a crepes-only food truck, after all. Why not? Discuss.